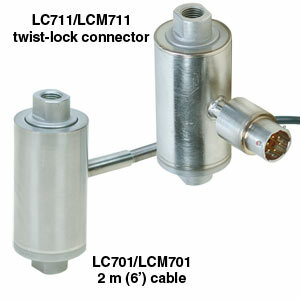 The LCM701 models have a 2 m cable with stripped end terminations. The LCM711 models have an integral connector on the body. These stainless steel load cells are ideal for measuring in-line tension forces. Applications include cables, cranes, support rods, engine test beds and industrial weighing. The LCM701 is also available in standard configurations, with 0-100 to 0-2,000 lb ranges and standard threads. Please see the LC701 for complete details, or contact our Pressure department for more information.